Were You Born For Something Greater? That nagging feeling that you were born for more than this. More than just imagining the life you want but never actually creating it. It’s like a craving for a deeper sense of meaning, a deeper sense of fulfilment, a deeper sense of contribution to the world. It’s possible jump out of bed in the morning and look forward to your day. It’s possible to feel inspired, energized and change people’s lives. But I’m not sure what I love doing! Will people really pay ME for what I love? I’m so tired after work, where will I find the time? I know because I’ve felt all of these before…. 9 years ago I decided to leave a corporate career paying 6 figures and became an unemployed Reiki Practitioner charging $20 per session! What I discovered was in front of me the whole time… a little something called “Un-transmuted Grandiosity”. It’s the one thing you MUST learn if you are ever going to create the lifestyle and the difference you desire in life (more on that later). 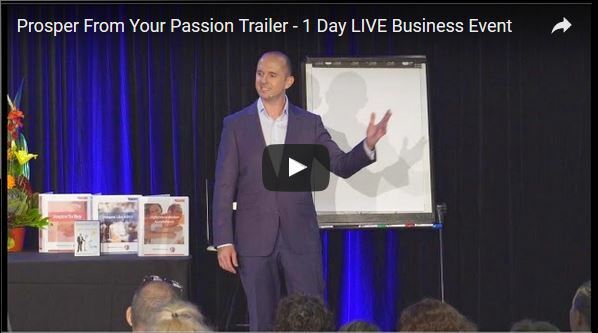 These days, the most common question I get, from thousands of Australians wanting to pursue their passion, is HOW? How did you leave the security of your job? How did you find what you love and attract clients? That’s exactly why we created this special event, “Prosper From Your Passion”. I invite you to learn the “how” (the exact steps I recommend you take). I invite you to join an, inspiring, supportive community of difference-makers like you. I invite you to rise above any of your current problems and create a life others only dream of. And most importantly, I invite you to discover for yourself the unquestionable clarity and power of Un-transmuted Grandiosity.